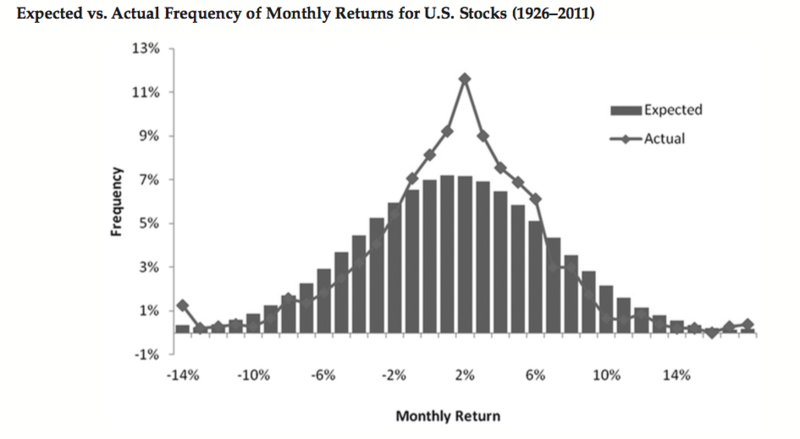 The chart above illustrates the distribution of monthly stock returns (the line) from 1926 through 2011, and compares it to what we would expect based on a "normal" distribution (the bars). Look at the left side of the chart, the negative returns. You will find, although we haven't experienced any lately, that stock losses are par for the course. And not just a few percent, either. Double-digit declines happen every so often, over a period of just a few weeks. What's more, if you look at the very far left of the chart, you'll see the last entry of "-14%." A decline of this magnitude (which happened on one day in October of 1987!) would come as a shock to most investors who haven't seen double-digit declines in a few years (unless you're in Gold). But the reality is double-digit declines on a short-term basis happen more often than standard assumptions would suggest. The line ("actual") at -14% sits about 3x higher than the bar ("expected"). Not only that, but double-digit declines have a significant impact on short-term results even when preceded by a bull market. And yet, unfortunately, these relatively infrequent episodes remain unpredictable. Reacting to them, as most investors do, by selling stocks and waiting for the "dust to settle" is typically the wrong thing to do, as swift recoveries are just as likely as further losses. What's arguably worse than reacting badly to unexpected market losses is to set out on a course of constantly trying to profit from market gains while avoiding or "hedging" against market losses through market timing and "tactical" asset allocation. The chart below shows the actual outcomes of three mutual fund investment portfolios starting 17 years ago in 2000: An all-stock allocation (Portfolio 1), a 60% stock/40% short-term bond allocation (Portfolio 2), and a prominent market-timing mutual fund (Portfolio 3). Portfolios 1 and 2 were simply rebalanced annually, accepting the inevitable ebbs and flows of the global stock market over the last 17 years. Portfolio 3 tried to outsmart the market by evaluating fundamentals, valuations, trends, etc. and reacting accordingly. 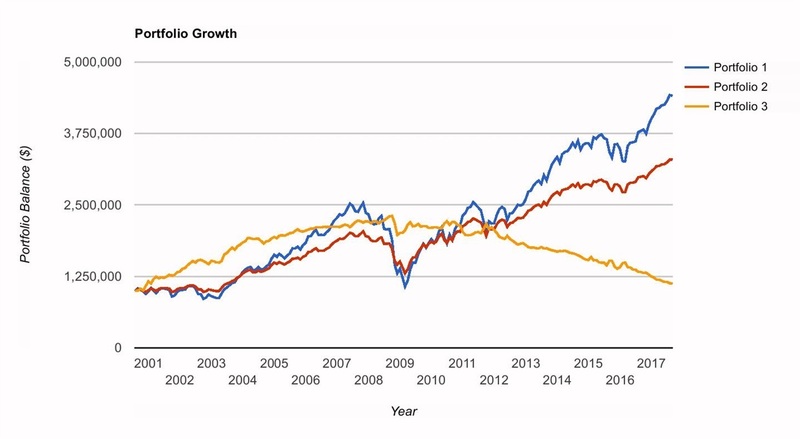 Portfolio 1 grew at +9.1% a year (double the S&P 500), Portfolio 2 had less short-term fluctuations at the expense of less long-term gains (+7.2%/yr), and Portfolio 3 basically ended at the same place it began (+0.7%/yr). Also notice that for a time, the market-timing portfolio was ahead. This shows that even ill-advised investment approaches sometimes work. Can you imagine how poorly your returns were if you started with the diversified stock portfolio and switched to the market-timing approach in 2009? I'll tell you: Your ending balance would have been just $773,065 (-1.5% per year) compared to $4,409,537 if you stayed invested in the all-stock portfolio, or $3,292,338 if you held the 60/40 portfolio through the entire period. Stock investing is a lot like the classic Rolling Stones song -- you can't always get what you want (the gains), but if you accept this fact and stick with your plan, you just might find, you'll get what you need. Better to know or be reminded of this before things get choppy.